GENE LUDWIG PASSED AWAY ON WEDNESDAY JULY 14, 2010. "This trio, which existed for only two years, would later appear on Sonny Stitt’s 1969 Prestige album, “Night Letter” (recorded on October 27 at Rudy Van Gelder’s studio in Englewood Cliffs, New Jersey) It marked the last time that Ludwig, Martino and Gelispie would ever play together and remained the only document of their ferociously swinging chemistry together for 44 years, until the unearthing of this live gem from the 118 Club. For guitar aficionados and fans of real-deal organ groups, it is the archaeological equivalent of discovering King Tut’s tomb." 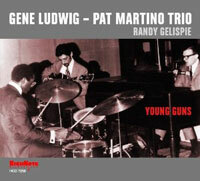 - Bill Milkowski - from the liner notes to new CD "YOUNG GUNS"
"Gene Ludwig was one of the true journeyman/warriors of jazz. He mastered the Hammond B3 organ and spent his life in jazz as one of its finest purveyors. Gene was an honest, sincere, loyal and above all, humble gentleman. He was one of the greatest living examples of how to remain true to this music and do it with total integrity. In addition to his many wonderful qualities, Gene possessed an undying love and respect for the African-American culture from which Jazz comes. This was evident in his earliest recordings and remained so for the rest of his life and career. Gene Ludwig is one of the giants of this music and he will be greatly missed"
"On his own gigs, he was something to hear. He could lift an audience in the same way that other masters like Jack McDuff, Jimmy McGriff or Jimmy Smith could. Whether it was a funky blues or the hippest standard, Gene delivered. When I heard that he was undertaking a Cole Porter project, I was pleased because I knew the material would bring out his best. If you want to hear what Gene was all about, just listen to the groove he sets on “I Love You”. That’s all you need to know." "Tradition, the handing down of customs, beliefs and stories from generation to generation, runs especially strong among jazz organists. They are a select crew, after all, piloting Jazz' Spruce Goose, the technically marvelous Hammond B-3 organ, through the turbulence of time and popular taste. It's no easy feat, of course, co-ordinating hands and feet, keys and pedals with mind and spirit. It's no secret either that, when done right, the Hammond beast soars like nothing else. Its twists and turns, jives and grooves, speak, communicate and resonate with you. Academics call this "soul-jazz." Fans call it good music. Gene Ludwig calls it a career, a life's work. 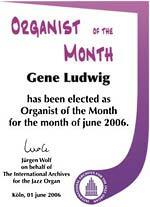 Playing organ since 1958, Ludwig's craft is an ongoing admiration of masters who came before, of traditions, of truth. Explaining it with words gets academic and dry. We'll let Gene explain it, let him take us on the ride."